DALLAS – Loyola-Chicago’s biggest fan is the team chaplain who prays with the players before games and gives them scouting reports the next day. 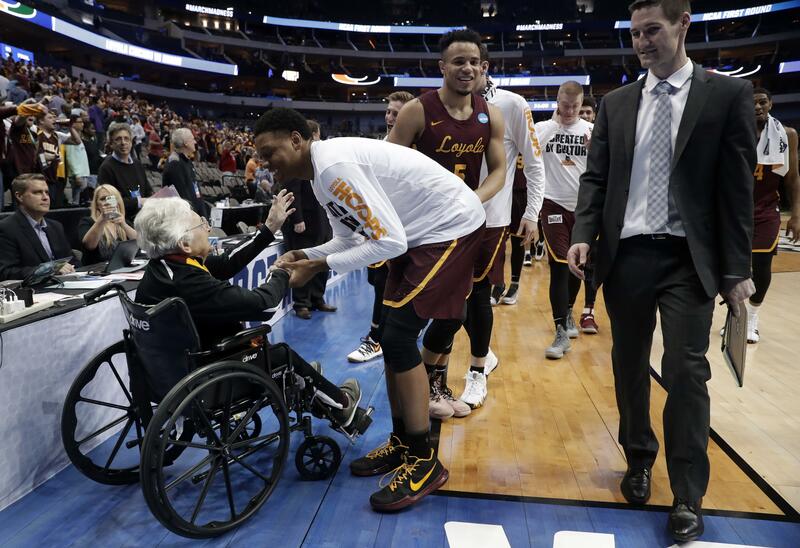 So 98-year-old Sister Jean Dolores Schmidt was more thankful than shocked when Donte Ingram hit a last-second 3-pointer to beat Miami in the Ramblers’ first NCAA Tournament game in 33 years. Schmidt will lead the pregame prayer again Saturday when 11th-seeded Loyola plays No. 3 seed Tennessee looking for a repeat of its last NCAA trip. The Ramblers reached the Sweet 16 in 1985 before losing to Patrick Ewing and Georgetown. The team chaplain since the early 1990s, Schmidt is an institution at home games, wearing her personalized Nikes. After Ingram’s winner, former President Barack Obama tweeted congratulations to the team – and its well-known nun. “When we have home games, I say a prayer with all the fans, too, and pray for the opponents, too, that none of us get hurt and that the referees do a good job and all that kind of stuff,” Schmidt said. Schmidt, who played high school basketball in San Francisco in the 1930s, gets around in a wheelchair these days because of a broken hip that caused her to miss games this season – a rarity over nearly 25 years. She still found a way to follow the Ramblers. “Where I was for rehab, I couldn’t get the picture so I watched play-by-play for every game I missed,” she said with her usual smile. The postgame feedback in those emails isn’t always positive. It’s individualized “on how they did, and whether it was good or whether they have to improve in certain parts,” Schmidt said. Loyola players certainly understand the spirit of the message. Ingram’s shot wasn’t exactly a Hail Mary, but it was from the March Madness logo several feet behind the 3-point line. The Ramblers will choose to believe Schmidt had something to do with it going in. The Ramblers get at least one more pregame prayer this season. Published: March 16, 2018, 9:42 a.m.